Click here for main events highlights. You ready for this? The 450 championship chase was set completely on its ear after a crazy main event, which, just to make it insane, feature Trey Canard and Chad Reed battling for the lead at one point. Points leader Ken Roczen was also in the hunt until casing a triple so badly he looked to have hurt himself--and although he did recover, he lost his points lead to Ryan Dungey. Of course all scripts this year have featured great starts from Andrew Short, and he grabbed another holeshot on his BTOSports.com KTM. Soon series' leader Roczen was right there, but Reed snuck a pass on him to take over second. Roczen tried to come back on Reed by going inside in a corner, but he didn't have the speed to clear a triple after that, and cased it--no, faced it--someting fierce. He quickly came to a stop on the track, and looked hurt. After about a lap went by, he sorted himself out, got back in the race, and would eventually take 16th. His points lead was gone, though. Click here for the clip. Meanwhile Reed, ever the opportunist, went after Short and took the lead. Soon he would be challenged by none other than Canard, his bitter rival for a week ago. They've clearly put it all behind them, as Canard made a clean move on the inside of Reed to take the lead and take off. Reed looked solid in second most of way until a late bobble sent him off the track, and Ryan Dungey got by him. The ever-consistent Dungey becomes the points leader with his runner-up finish. For a lot of the race, Dungey was dealing with heat from Eli Tomac, but Dungey got away from him in the second half of the race, just like he did last week at Anaheim. But Canard was the story, holding on to win his first supercross since 2011. With he and Reed both finishing on the podium, it was a beautiful turnaround from last week's debacle. And now the championship once again looks wide open. Click here for the main event highlights. 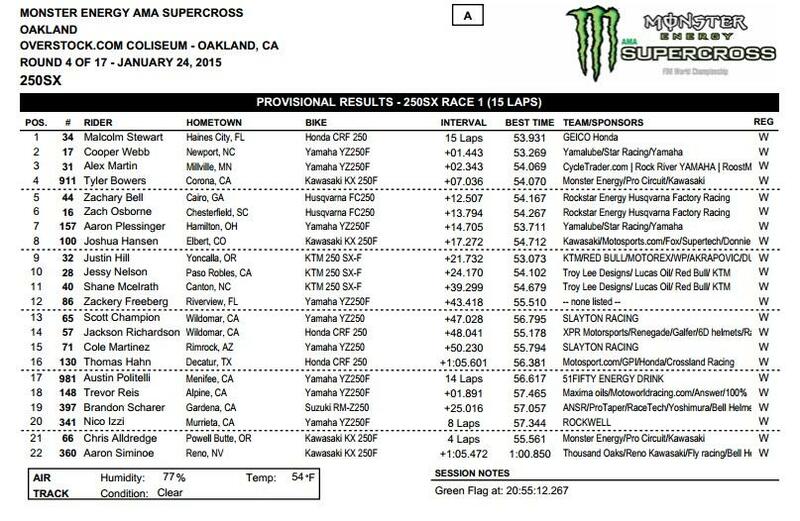 The Oakland fans were treated to a fantastic 250SX race here in Oakland. Zach Bell nailed the holeshot but a few turns in he got together with Chris Alldredge. Somehow the two didn’t go down, but Bell lost a bunch of time, handing Alldredge a decent lead. Shortly after Malcolm Stewart took over the lead, but Alldredge battled back, bumping Malcolm. That resulted in a bobble, and Justin Hill hit Alldredge in the air, nearly taking him down. Alldredge kept it together but he jumped off the track, sending track workers scurrying. A few laps later he crashed hard and that was it for him for the night. The carnage wasn’t limited to Alldredge either—it was everywhere! Jessy Nelson went down on the first lap, Jackson Richardson went down, and Justin Hill went down all by himself after passing Stewart for the lead and building a gap. Then Tyler Bowers came in hard on Cooper Webb in about fifth or sixth and Webb went down. More on that in a minute. Up front it was Stewart, but Alex Martin was pressuring him for the lead. Stewart was able to build a little gap, but Martin hung tough. By that time all eyes were on Webb though, as he was absolutely flying, spinning laps roughly two seconds faster than the leaders. Late in the race he’d caught Bowers and the crowd waited for the inevitable punt. But the punt never came, and Webb put a pass on Bowers that was so clean you could’ve eaten off it. Webb would chase down Martin, and with less than a lap left he went after Stewart. He nearly got him too, but time ran out and Stewart won his first supercross race. Credit to Martin too, who takes home his first ever supercross.